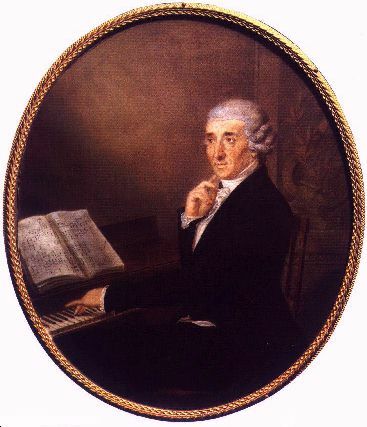 Joseph Haydn was born on March 31, 1732, in Austria. He died on May 31, 1809. There’s plenty of Haydn music to choose from, much of it exquisitely good for casual listening: concertos, string quartets, piano trios, symphonies, etc. But if you want to move to the slightly more ambitious side of Haydn’s works, try his oratorio The Creation. Haydn composed it late in life, when he could afford to take his time with it, and was self-consciously writing it for the ages. Haydn’s Creation is such a rich composition that it was the first piece of music to make it into our Great Books curriculum at Biola’s Torrey Honors Institute. Students are assigned to listen attentively to a recording of the oratorio twice before assembling for a 3-hour Socratic session discussing it. It might sound a little trendy to say it this way, but we treat the entire composition as a text, and we proceed to read and discuss it, words and music alike. And we don’t just do that because we’ve caught that humanities disease that makes us think everything is text, that comparative literature mania that yearns to read social text, cultural text, embodied text, video-game text, all the world’s a text, bla bla bla. No, we read and listen to Haydn’s Creation as a great text because it really asks to be analyzed as text, in at least three ways. For one thing, the libretto of The Creation is long and has a lot of words in it; words that are carefully put together. The backbone of the piece is the creation narrative of Genesis, counting off the days. But other biblical texts, such as Psalms 19 and 145 are there, too. And as the work progresses, bits of Milton’s Paradise Lost start showing up enough to make you wonder if The Creation isn’t really an oratorio based on Milton more than on Scripture. The recitatives give you long blocks of theological argument and exposition, straight of an Enlightenment take on Milton’s take on the Bible. Discuss! Second, at several points, Haydn puts his music conspicuously at the service of the text, even to the point of engaging in some goofy musical word-painting. When the various animals emerge, you can hear the orchestral instruments working hard to mimic the twittering birds, the slithering snake, and the roaring lion. This direct linking of music to word is a great jumping-off point for the more abstract sections of the piece, where sound is being itself rather than serving to illustrate the words. You could actually draw a diagram with “pure illustration” at one end and “pure musical sound” at the other end, and track Haydn’s movements back and forth along the continuum throughout the piece. Sometimes a violin is a violin, but sometimes it is sunshine. And that brings us to the third way The Creation invites analytic reading: At its best moments, this oratorio stops telling you about how creation is praising God, and musically enacts the praise of God. Haydn’s genius in composing this music for these words on this theme all comes together in those places where you realize that here is a teacher who does not just tell you that the goal of human life is to praise God; here is a teacher who leads you in that sung praise. Haydn was very religiously inclined, and was loyally devoted to the faith in which he was raised. He was very strongly convinced in his heart that all human destiny is under God’s guiding hand, that God rewards the good and the evil, that all talents come from above. All his larger scores begin with the words In nomine Domini [“In the name of the Lord”] and end with Laus Deo or Soli Deo gloria [“Praise to God”; “Glory to God alone”]. “If my composing is not proceeding so well,” I heard him say, “I walk up and down the room with my rosary in my hand, say several Aves, and then ideas come to me again.” Haydn left every man to his own conviction and recognized all as brothers. In general, his devotion was not of the gloomy, always suffering sort, but rather cheerful and reconciled, and in this character, moreover, he wrote all his church music. His patriarchal, devout spirit is particularly expressed in Die Schöpfung, and hence he was bound to be more successful in this composition than a hundred other masters. A natural consequence of Haydn’s religiosity was his modesty, for his talent was not his own doing, rather a gracious gift from Heaven, to whom he believed he must show himself thankful.